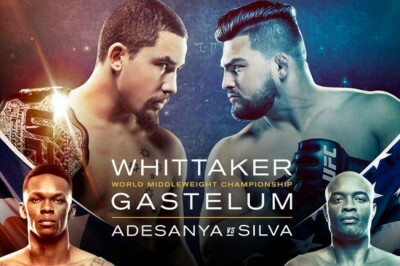 Whittaker vs. Gastelum at the Rod Laver Arena in Melbourne, Australia. Herb Dean the third man in the cage for the main event. Adesanya feinting before landing an outside leg kick. Silva dodges a jab. 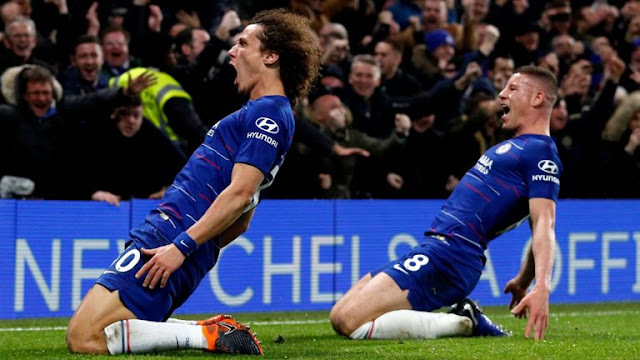 They trade leg kicks. High hook kick by Adesanya glances Silva. Silva starts to come forward an Adesanya lands a clean 1-2. Right hand by Adesanya seems to stagger Silva. Adesanya opening up. Silva with a straight left as he pursues Adesanya. Straight right by Adesanya and Silva just lowers his hands and stares at him, Adesanya keeps his own pace. Straight left lands for Adesanya but Silva dodges the follow-up high kick. Straight left again for Adesanya. Silva whiffs on a flashy spinning kick. Adesanya misses a kick of his own and then poses to close out the round. MMA Fighting scores the round 10-9, Adesanya. Counter right hand by Silva lands and Adesanya shakes his head. Adesanya looking to score with front kicks to the body. He lands a 1-1-2, but Silva again drops his hands. Spin kick by Silva is caught and Adesanya slips away, putting Silva against the cage. Adesanya starts getting fancy by pushing off the cage and Silva makes him pay with a right hand. Silva now with the 1-2. He lands a left hook in the clinch. Snapping outside leg kick by Adesanya. Elbow feint by Adesanya, then a right hook. Silva answers with a good right hand up top. Adesanya clinches to slow Silva down. He follows with more front kicks and one to the leg. Straight right by Adesanya, inside leg kick by Silva. Adesanya closing the round with strikes from distance, but Silva gets in with a clinch and lands some good punches. Very, very close round. MMA Fighting scores the round 10-9, Adesanya. Overall, 20-18 Adesanya. Left hand by Adesanya, Silva gestures to the referee indicating an eye poke but Adesanya says it was all knuckle. Action quickly resumes. Hard leg kick by Adesanya and Silva bends over, exaggerating the impact. Adesanya stays relaxed. He dodges a big flying knee. It looks like Silva’s eye is swelling. He stands by the cage and points to the ground, telling Adesanya to come towards him. Adesanya still not over-pursuing. He moves to the center of the Octagon and tells Silva to come to him now. Outside leg kicks by Adesanya are landing clean. Front kick by Adesanya. Silva lands a leg kick of his own, Adesanya steps in with a punch to the body. Silva looking very loose, his hands low, looking to counter. Straight punches by Adesanya and he’s keeping Silva from getting his offense off. Quick counter right by Silva. Punch to the stomach by Adesanya. Left hand over the top gets through. Silva drops his hands and just eats three punches to the jaw and smiles. Counter left glances Adesanya’s chin. Spinning techniques at the end, neither landing, and the fight ends with an embrace. The Ultimate Fighting Championship (UFC) brings you UFC 234 headlined by middleweight champion Robert Whittaker against Kelvin Gastelum and supported by contenders Anderson Silva vs. Israel Adesanya at the Rod Laver Arena in Melbourne, Australia. Robert Whittaker is on a nine fight winning streak, defending the middleweight title twice already against Yoel Romero. He owns a record 13 - 2 in the UFC and with an undefeated record that spans since 2014. Kelvin Gastelum on the other hand is on a twotfight winning streak with recent wins against former champion Michael Bisping (KO) and Ronaldo Souza (Decision). He has been inactive since May 2018. 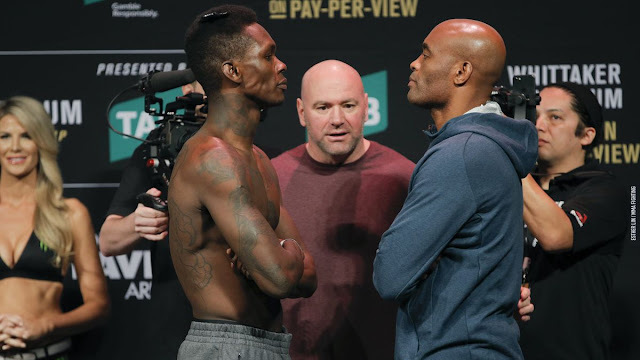 The Co-main event will have 43 year old, Anderson Silva and undefeated Israel Adesanya lock horns in an highly anticipated match up. 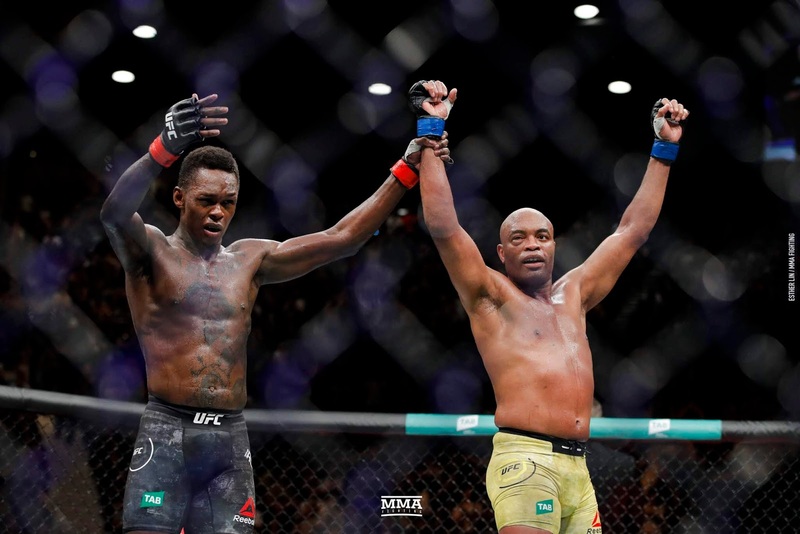 Anderson Silva will be hoping to put his Career back in order, after owning just a win in his last six fights which was a unanimous decision win over Derek Brunson. Adesanya, owns a very active undefeated recordrin the UFC, fighting four times in 2018 and will be in line for a title fight, if he comes out victorious against Silva. His recent wins include Derek Brunson, Brad Tavarez and Marvin Vettori.